Marjan Riahi (SFN)- Born in Treviso, Italy, Sergio Manfio He is the President and the Head of the creative department of Gruppo Alcuni Srl. He is a world renowned Italian author and director in the animation domain who has directed many short and feature animation films and series. Manfio works also in the world of theatre. He has written and staged over 50 performances, and alternated directing with acting. As well as these activities, he along with his brother, Francesco launched Ciak Junior Project and Festival which will be celebrating its 20th anniversary May 25-30 in Treviso. In this email interview, Sergio Manfio explains about Ciak Junior. Ciak Junior Project has been established with the aim of introducing image language to children. When was the idea inspired and how much did it take to perform it? This year marks the twentieth edition of the Ciak Junior project which to date has involved children from four continents. The constant element of a project such as ours is to continually evolve, for example seven years ago the “Audiovisual Programme for Children’s Education” Prize was created which deals with the promotion of existing examples of “good television” for minors and has created a meeting space for TV producers, academics and communication specialists on this subject. Why have you decided to focus on children’s films? And why did you choose the range of 10 to 15 years old? From the very start the Ciak Junior project has concentrated its attention on teaching audiovisual communication to young people. The choice to focus on the 10-15 targets is determined by the fact that we consider this age group particularly open to the type of approach we use. Till now, over 20 countries have participated in this project. How do you contact with different institutions, TVs, and children of the other countries? A team of dedicated people is responsible for contacting institutions and TV broadcasters from around the world who may be interested in participating in the initiative. Every year we try to increase the number of participating countries, spreading information on Ciak Junior during industry markets, as well as sending out promotional materials. When was Ciak Junior Festival established? What were your goals? 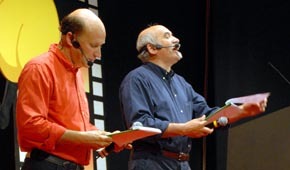 Born in 1989, Ciak Junior’s main goal has always been to explain to children how an audiovisual product is born – in this case a short film of approximately 10 minutes – getting them to actively take part in all the production phases; from the writing of the script and story to the actual filming. How much have you reached to your defined goals during these years? The goals of a project such as this one, unfortunately, or fortunately, can never be said to have been reached completely. We are in fact constantly striving to come nearer to finding the best way of helping young people to understand the language of audiovisuals, continuing to create moments for debate and discussion between children from many different countries around the world. Have any new countries joined Ciak Junior in its next edition of the Festival? The new entry for this twentieth edition of the Festival is Sweden who has taken part in the Seventh Edition of the “Audiovisual Programme for Children’s Education” Prize with three programmes. After a short absence China and South Africa will also once again be participating. Does Ciak Junior hold any workshops or special programmes for training children? During the week of the Festival (Treviso, May 25-30, 2009) the following have been organised: “A Cartoon in Four Days” – a marathon animation workshop in which over 80 children will take part, led by Gruppo Alcuni animators, where participants will learn all the secrets of creating an animated cartoon. The production of “A Film all Together” is also a crucial event of the festival. The creation and shooting of this short film is a unique opportunity for kids of various different nationalities to get to know each other and have fun acting together, and also reinforcing their active role in the world of communicating through images. Another very special moment for the young participants of the Festival will be the activity in which they can exchange views and opinions and also share some of the traditions from their respective countries. What have been the main themes of most films during these years? Do you consider any special limitation for selecting the theme and story? The themes of the over 300 films created in the last twenty years by various different countries around the world make up an impressive archive of “feelings” of the children of today. The Ciak Junior short films speak about their young authors and the big and small problems which face them: from school to the family, from sport to drugs, from disabilities to friendship. Despite the thousands of kilometres which divide the adolescents of the different countries, the problems, the worries, but above all the dreams expressed in these films are often very similar. Integration, bullying, cultural differences, new technologies, love, are all themes dealt with in the short films of this year. There are no particular limitations or instructions which we supply to the youngsters for writing their short stories to be transformed into films; on the contrary we want them to feel as free as possible in expressing themselves. In the selection phase we try to choose the ones which we feel are the most representative. Have the combination of children together with a professional filmmaking team been effective in making these works? What have been the results? It is of fundamental importance for us to respect one of the prerogatives of the project; this is that professionals of the audiovisual sector and pupils work together in producing the short films. Once the stories have been chosen, along with the young authors, we write the script, then we search for the locations for the shooting and we bring the film to life, naturally using the pupils as the main protagonists. How much are you optimist about these children to be successful filmmakers in the future? Has any brilliant talent been discovered among them till now? The objective of a project like Ciak Junior is not to create young future filmmakers, but just to bring youngsters closer to the world of Cinema, supplying them with notions which often the school is unable to offer. The final result is also that of offering them a unique opportunity to compare their experiences with those of other pupils and teachers who have undertaken the same journey in various countries in Europe and around the world such as Ireland, Germany, India, South Africa and many others. If because of this children are inspired to become future industry professionals, then so much the better. Your festival is being managed by two brothers. How do you share the responsibilities? Tell us about the kind of cooperation you have. Francesco and I have created the international Festival of Ciak Junior, of which we are the artistic directors, and together we make every decision as regards the event. We meet regularly in order to try and better it and examine the best way in which to closely monitor the youth of today. Our objective is to continue to involve as many countries as possible from around the world in the Ciak Junior project and to increase the awareness of producers of television programmes for children.